The more I use the new Apple TV the more I like it. The previous model was likable and easy to use but we had no options for live content. Now with a full app store and a community of excited developers the sky is the limit for this set top box. It was surprising to hear the bump in price to $169 or $199 depending on memory configuration but with the updated remote control and additional features it is well worth the price point in my opinion. The first surprise was the remote control and updated HDMI. The new HDMI port allows the Apple TV to turn on some TV's and control the volume with no configuration. It just works out of the box. Apple TV setup is a breeze if it works well. If not try rebooting your phone and tap the phone on the TV again to do the setup. While it is still 1080p and not 4k don't worry I am sure there is good reason for this. One being the 4k standard isn't fully defined yet and Apple doesn't want to have to make changes or tell users sorry your 4k device doesn't work with the 4k standard. Waiting until the standards are settled is just fine by me. Downside of the setup process is users still have to login to each app one at a time and go to a webpage and enter the code to authorize the Apple TV to the app. If you have multiple Apple TV's at home this is a task that will have to be done for each. I would love to see Apple store authorizations in iCloud and family sharing so this only has to be done once and the whole family can use it. We have live TV shows. I watch TWiT every week and now I can watch it live without having to Airplay to the Apple TV from another device. The odd thing that has disappeared from the Apple TV lineup is Podcasts. So now I can watch live shows on my AppleTV but I can't go back to my Podcast app and listen to some on my phone and have it sync with the TV and just work. I assume Apple will release a podcast app soon. Airplay while it has always worked well sometimes was slow to connect or would fail to connect from time to time. These issues seem to have been resolved and Airplay connects quickly and stays connected now. The remote control needs better indication of what is touch surface and what isn't. With the buttons in the middle it is hard to orient the remote in a dark room. Siri also still feels very beta. She can do some cool context aware searches but certain things she just apologizes for not being able to do and sometimes just displays info on screen and doesn't speak a response. When asking about weather one might expect to hear a response and not just see it printed on screen. 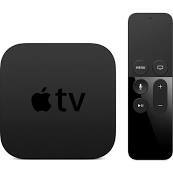 Overall AppleTV is a nice upgrade but it isn't what it does today that has me so excited about it. It is what is going to come over the next year or so that is going to make it a ground breaking set top box. The more I use it the more I like the user interface and the ease of navigation. More capabilities from Siri and I might just remove my other set top boxes. Now Amazon needs to put their app on the Apple TV so I don't have to switch sources to watch content from Amazon or I may just stop buying form Amazon all together.